1.How do I schedule a wedding consultation? 2.How do I reserve my date and time with Ms. Scarlett's Flowers? 3.How far in advance of my wedding date should we meet? 4.What do I need to bring to my Detailed Consultation? 5.What is "Ms. Scarlett's Flowers" wedding delivery area? 6.Why aren't all the bouquets and designs on your site shown with prices? 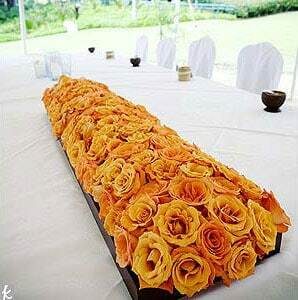 7.Why do the flower prices vary throughout the year? Your wedding deserves our undivided attention. For specific pricing and information, an appointment with one of our consultants is required. Please phone us toll free at 800-714-4438. How do I reserve my date and time with "Ms. Scarlett's Flowers"? We require a $250.00 non-refundable deposit to guarantee our availability for the date and time of your wedding. This deposit is applied to you final total balance. Please see our Wedding Policies for further information. How far in advance of my wedding date should we meet? In order for us to give specific advice on floral accessories, we need to know the locations, date, time and any fashions with which flowers will coordinate - especially your Bridal and Bridesmaid gowns. We accept bookings one year in advance of the wedding date. Simply reserve our services with a deposit of just $250.00 and schedule a detailed consultation after the above items have been selected/purchased. What do I need to bring to my Detailed Consultation? Please bring any photos of gowns, locations and accessories with which you wish your flowers to coordinate plus a list of people with which you wish to provide personal flowers (corsages, boutonnieres, fingertip bouquets, etc...). Fabric samples from both fashions and table linens are also quite helpful. The more information you provide our consultants, the better and more specific advice we can offer you. What is "Ms. Scarlett's Flowers" Wedding Delivery Area? Why aren't all the bouquets and designs on your site shown with prices? The price of any bouquet or design has several components - the quantity and varieties of flowers and foliages used, the season in which the design will be made, the type of containers/accessories used and amount of time and expertise required to create the design. Due to the variance of fresh flower costs as a result of seasonality, the price of a particular bouquet or arrangement may fluctuate more than 100% if made when the flowers pictured are out-of-season. We need more information about your particular date in order for us to quote you specific prices. Choosing flowers in season always offers the very best value. Price may also vary with the quality of ribbon; the value of the container or the addition or elimination of special accessories. Seasonality and availability influence the price of each flower variety. Flowers out-of-season in North America may be obtained from growers as far away as Australia, New Zealand, South Africa or Holland as well as other distant locations. The following flowers are generally available throughout the year with relatively little price fluctuation: alstroemeria, anthurium, carnations, chrysanthemums, gardenias, gerberas, gladiolus, liatris, orchids (dendrobium) and snapdragons. Even these can be found more plentifully during their peak seasons (usually in the summer). Flowers needed during particular seasons may also be a premium price if they are in much-demanded colors. For example, red flowers are in great demand during the Christmas season. To get the most out of your budget during that holiday season, we often recommend considering white or non-traditional holiday-colored blossoms with red accessories such as berries, ribbons or candles to achieve your desired effect. Ask your consultant for the best values available during your season.